I’ve never been a fan of button down shirts. Don’t get me wrong, I love the way they look, but I’ve always been too lazy to…you know…iron them and stuff. But, I guess now that I’m 30+, I should grow up, eh? It’s days like this one that I wish I still took my fashion photos like I used to – from the neck down. Please disregard my hair and make-up. Reason #4,523 that I will never be a “real fashion blogger” – I’m not very good with hair or make-up. Oh well. Anywho, I purchased this gingham shirt with an online coupon code for Gap.com. I thought I’d try styling it a couple ways – #1 with a tied front. 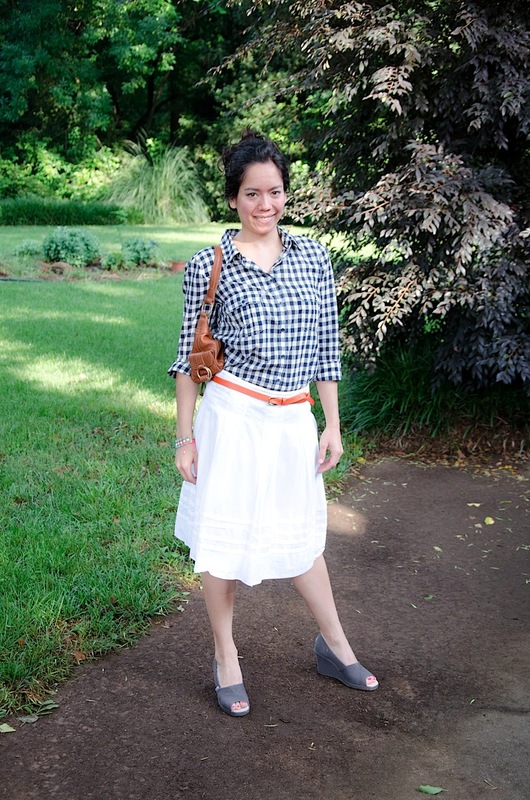 #2 – with the shirt tucked in and a pop of color via accessories. Which way do you think works better? #1 or #2? Side note: it’s funny how you think something looks good on you and then you see a photo of it and realize it’s off. I have a couple full skirts like this, but I’m realizing they’re all too long. I believe it was What Not to Wear that taught me that skirts at or just above the knee look best on short people. Does this sound right to you? This one is looking a little long. Me-thinks I need to take a couple things to the tailor. Maybe they can fix it? Also, I should probably invest in a full-length mirror. I think I like your #2 option better! But both are cute! I tend to love tucking shirts in lately, and skinny belts/accessories. I used to think tucking tops in made me look “old” but now I think it just helps you look more feminine, with a defined waist and cleanly put together. 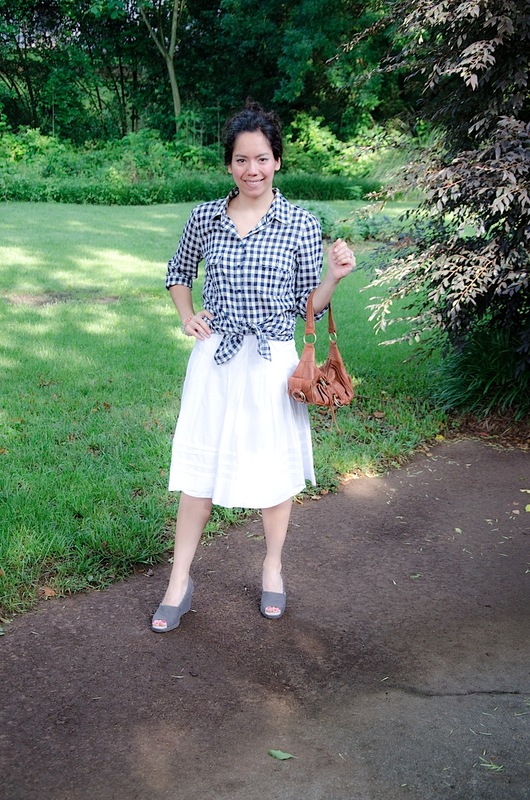 Loving the gingham! I just got some pink crop-pants from Gap yesterday that I’m LOVING! I vote No. 2. And you are correct about the skirt rule: Short people (like you and me) should keep hems a bit above the knee to prevent cutting off your body in a strange way and stunting your height. I would think that the tailor could take a bit off the top (by the waistband) or the hem and it would be perfect! Looks like a good summery skirt, so you definitely don’t want to get rid of it! 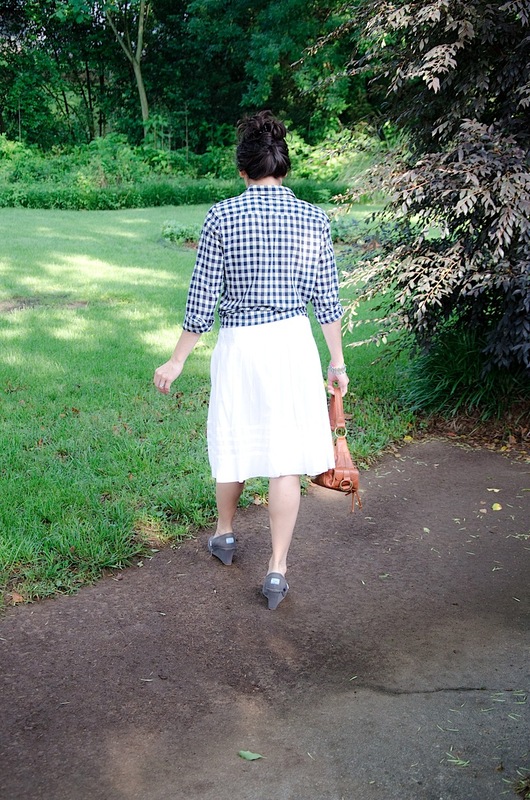 Also, I heard the other day that skirts should hit at the knee or up to 2″ above the knee. It’s tough for me too cause I’m 5′. the knee or up to 2″ rule sounds like what I heard, too. 🙂 Maybe I should start buying “petite”? petite stuff is usually too long too! except for the winter coat i bought in petite where the arms are almost too short – alas! Also, you have beautiful hair and a gorgeous face… You don’t need tons of makeup! You always look so cute!!! 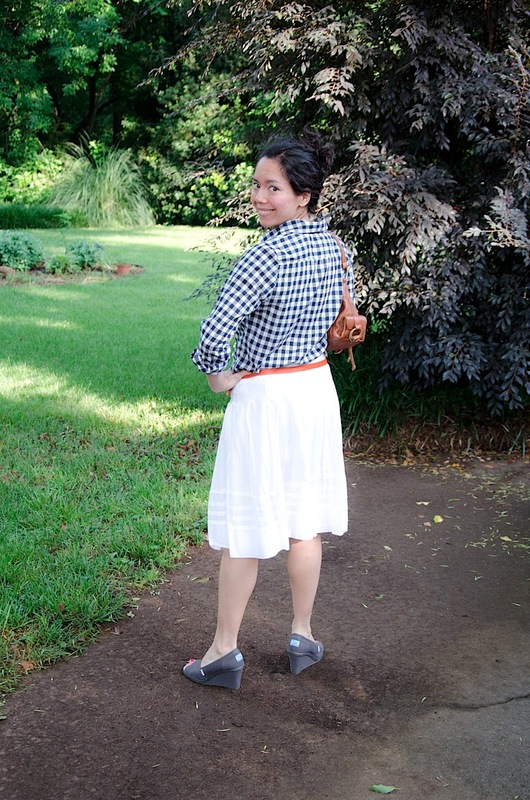 #2 is the best, and you’re right about the skirt needing to be shorter (cute skirt, tho!) I think a wider, but still colorful belt would show off your waist more and look better with that flowy skirt. Love those shoes! I love the idea of a more colorful belt. Maybe pink? 🙂 I don’t have anything wider and colored at the moment, with the exception of a wide red belt that is too small to go around my hips (it’s meant for the waist). I have to admit, I am a long time reader and remember the headless fashion pictures from the previous blog :). I think with the first look, you can unbutton one more from the bottom and tie the shirt a little higher. The skirt needs to sit higher on your waist, so it might be a good idea to look into getting the skirt tailored to sit higher. That would make both looks 1 and 2 more cohesive with a higher waisted skirt. And flat sandals, flats, or sandals that show off more skin would complete the look. I probably should have mentioned in the post that I was wearing this outfit to work. So, I tried keeping the look sort of conservative. But, if I were wearing the outfit for fun, I totally love the idea of doing one less button and making the tie higher. Also, you’re right about the skirt fit. I bought this before I lost a little weight, so it’s sitting lower than it should. Maybe I can have the tailor fix it?